Acrostic peal spelling out AALIYAH. Specially arranged and rung to celebrate the first birthday of the conductor’s niece Aaliyah Anne Bishop (11th Feb). Yvonne Woodcock, Aaliyah’s grandma & tower captain here wishes to be associated with this peal. With thanks to John Ottaway for standing in at short notice and with the band’s best wishes to Stephen Clarke who was due to ring. Welcome back to peal ringing Janet! Last updated Friday, 8 February 2019 at 15:50:58. First submitted Friday, 8 February 2019 at 15:11:53 by Christopher C P Woodcock. 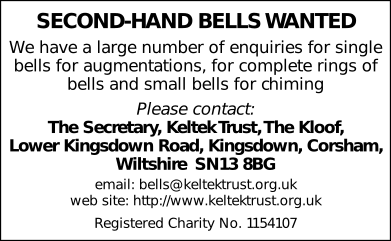 Sent for publication in The Ringing World on Thursday, 14 February 2019 at 23:35:03, and printed in issue 5627, page 206.